Javier Rodriguez’s installation Principal Peripherals of Storage creates a series of puzzles seemingly unintelligible to the naked eye. Using a large number of maculaturas – overprint sheets of paper found in printing houses – together with wooden shipping pallets, the artist created an intricate environment: a series of islands and a multi-layered labyrinth. 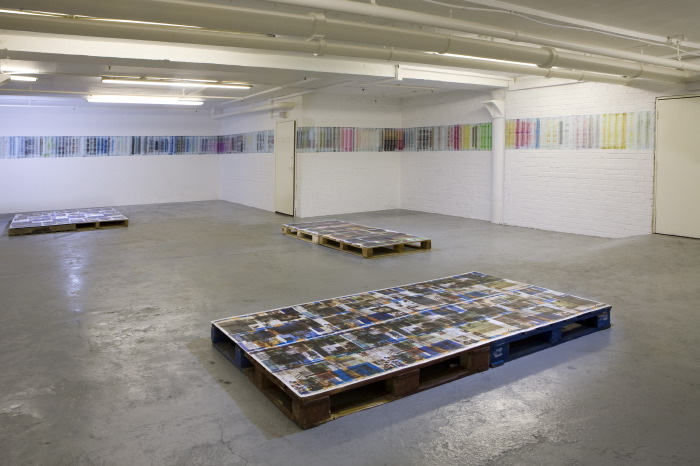 The pallet platforms support an array of prints on paper composed in an abstract (though conceivably logical) chromatic and thematic progression – each of those has received multiple impressions of pages from newspapers, magazines, advertising and packaging. The text and images are pressed one on top of the other and out of register, creating levels of saturation, both of colour and content, not found in regular publications. The fine features in the sheets are nearly impossible to read, but the overall patterns emerging across the larger compositions demand an attention to detail, not least because their placement requires the viewer to bend down and come in close proximity with the surface of the work. Only in a pair of the works, the principal peripherals of storage from which the exhibition takes its title, the subject matter is immediately apparent, and that because the pages are graphic and appear to have come from a children’s school book. The graphic and textual elements repeat from one sheet to another, fading each time, and this failure of reproducibility becomes key. The press – both in the wider media sense and as a technical solution – operates in a recurring cycle, creating new output every day; the accumulative yield soon becomes impossible to interpret, and each message, article or image is pasted on top of another. 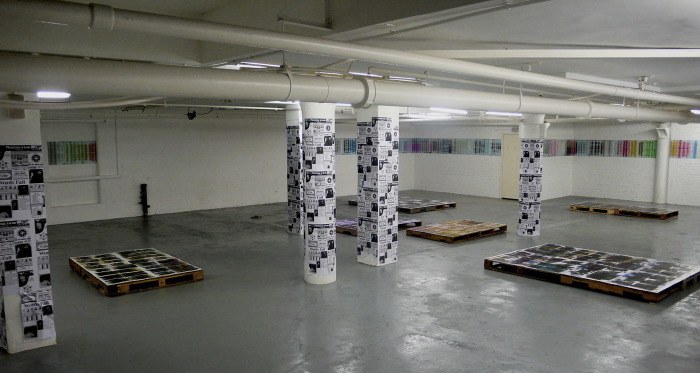 yesterday’s news was old news, the printed message is now becoming obsolete from one copy to the next and is continuously recycled, much like the materials in the installation themselves. The newspaper - a container - has been relegated to the peripheries, islands reminiscent of those in the installation. The resulting vulnerability of the print is in stark contrast with its excess. pallets. The construction is redundant, but despite the hybrid construction of the maculaturas, the works don’t appear to have a beginning or an end. Alongside the maculaturas, the installation draws on other aspects of printing technology, using recycled cleaning rolls covered with inked lines. The banners, which from a distance resemble a wall panel densely packed with text and on closer inspection recall Bridget Riley’s line paintings, are in reality mere residue, leftovers which no longer carry a message. In a progression similar to that visible in the floor pieces, the wall is a vivid sequence of colours bleeding through one another, recreating the visible spectrum. In the past, Rodriguez has worked predominately with collage, paper-cuts, and prints. Using materials from collected books, texts and selected printed imagery, he creates precise finite expressions and explorations of recurring social patterns and history. The new works, while constructed from readymade materials, continue the observation of the interactions between the media and political realities. The production of the posters installed on the columns in the gallery were, in fact, the connection which led to the development of the floor and wall pieces: working with a printer, Rodriguez discovered a new collection of materials and processes. 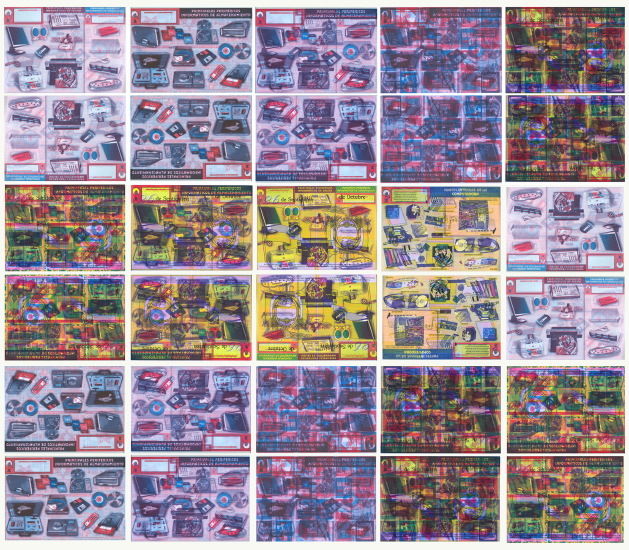 Drawing on materials from popular Venezuelan and UK press, the posters create an indecipherable classifieds page in which fragmented notices range from the aetherial to the absurd. This overload of content - here more familiar in its form of presentation - and the sharp appearance of the texts and images overpowers the eye, and it is only the flow of information that remains. Marshall McLuhan’s assertion that the medium itself becomes the message acquires a new relevance, as each individual message competes with many others in parallel. Connecting the complex with the simple and the heavy with the disposable, Rodriguez’s work does not offer a defeatist picture. Instead, it affords a view of the wider structure and allows its aesthetics to come to the fore. Javier Rodriguez (1975, Venezuela) studied at the Federico Brandt Art School, Caracas. He has lived and worked in New York, Tel Aviv, Berlin and currently alternates between London and Caracas. He has exhibited internationally at galleries, biennials and fairs including: Galeria Fernando Zubillaga, Galeria Minotauro, Iberoamerican Art Fair (FIA), Caracas, Espacio Diverso (Quito, Ecuador), Art Miami, Pinta Art Fair (New York), Espace Meyer Zafra (Paris), The Mayfair Arts Club, Maddox Arts, T1+2 Gallery, 20 Hoxton Square Gallery and Zoo Art Fair (London). He recently took 1st place in the City of Caracas Municipal Art Prize and was commissioned by Kings College, London, to create Malinconia. His work has been featured in various publications including Collage, assembling Contemporary Art by Black Dog publishing, London, The British journal of Psychiatry and Los Flamencos no Comen, an international art review based in France. Waterside Project Space is Supported by the National Lottery through Arts Council England. We would like to thank the artist, Jack Brindley, Matthew Hurrod, Manuel Vazquez and Maxa Zoller.